Thoughtshop is a 360-degree advertising and communication agency started by Vipin Dhyani. With more than a decade of experience in advertising, Mr Dhyani has the unique distinction of working for a diverse portfolio of brands and being involved in more than 120 ad films over the last couple of years. Thoughtshop has conceptualised and created communication films for various products for Parle which include Hide and Seek, Hide and Seek Bourbon, Milano, MonacoSmart Chips, Mango Bite, Krackjack. It has also created the TVCs for Nirma Washing powder, D-Cold Total amongst others. In the recent past Thoughtshop bagged three awards in the Big Bang Awards 2011 in Bangalore. One gold for Krackjack radio spot titled ‘Ladies tailor’, a bronze for another radio spot, ‘marriage councillor’ for the same and another bronze in TVC category for Parle Milano featuring Hrithik Roshan. In 2010, the agency has also won silver in Goa Festival for its Nirma washing powder TVC titled as ‘Splash’. Prior to this, Mr Dhyani has worked with Everest Brand Solutions and Mudra as Creative Director. 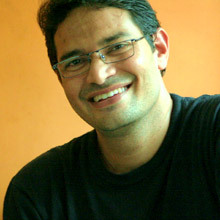 He has also had stints with Lowe Lintas and Grey Worldwide in Mumbai. Q: What makes Thoughtshop Advertising different from the other advertising agencies? Why does a client choose Thoughtshop over other agencies? Our in-depth understanding of consumer insights, sound creative and a real good turnaround time. We are not selling ideas we like. We are not even selling ideas liked by our clients. We create ads that our TG appreciates. Pure honesty, sincerity and a very no-nonsense approach helps us whenever we approach a new client. Q: How satisfied are you with the progress of Thoughtshop Advertising since its inception? Has the outcome matched your expectations? I am very satisfied with the way things are shaping up. Initially it took me some time to figure out how to go about it. On one side, there was that sense of calmness which you crave in your own place and on the other side you need that aggression which is required to win business. Fortunately I could acquire both. And I am more than happy to achieve that unattainable balance. Overall, it was a plunge worth taking. The outcome has been very fruitful, I should say, but expectations are higher than what we have achieved so far. The hunger for good creative work is never ending and never satisfying in our field. Q: You have worked with some of the biggest agencies in India and then started one on your own. Could you highlight some pros and cons of working with a bigger agency and starting something on your own? When you are part of a big atmosphere, all you need to worry about your brand and its creative standards. You don’t actually think about the business and the ‘survival’ part of it. But when you run your own set up, you are not just responsible for your survival but for the whole team. In simple words, with bigger outfits I felt like a civilian, while on my own, it’s like an army man on a border, always on my toes, alert and responsible. Q: How much importance do you give to winning awards? Do you think that awards justify the measurement of creativity? I would say it is very important to win awards. If we belong to the creative fraternity, we have our moments of escalation, moments of getting admirations and moments of being known. Fair enough. But the sad part of the business is that sometimes an award-winning entry could be completely plagiarized and a genuinely beautiful work may go unnoticed at the same time. Q: These days awards focus on not only creativity but effectiveness as well. According to you which out of the two is a focus point while creating a brand communication? Efficacy awards basically talk about the real strategy transforming to a sound creative that is being liked and owned by the real end consumer. It is like performing a play in front of the real audience who can appreciate or completely disown you, depending on your performance. On the other hand, a creative show ‘primarily’ prefers and promotes a disruptive and innovative entry whether it is from mainstream product or a service or not. That’s where it creates a separation line. I think if we believe in creating a brand and not just one-off clever ads, we can create genuine work worth celebrating at both levels. Q: Could you throw some light on the brands you are working on? We are doing two new launches for Parle this year. The communication package is ready. Apart from Parle, we will be working for Nirma for at least one project while for Bayer CropScience, we are going to launch two projects (Decis & ECB) very soon. Then there is one property we have created for 9xM channel. It is going to be the first female animated character. We have got one more account recently, GET Punjabi channel. After a huge success in US andCanada, they are launchingIndia’s first GEC in Punjabi. Ekta Kapoor is going to be the producer for them in terms of providing content and we will be looking after the advertising and promotions. Q: Independent agencies are doing fairly well these days and competing with the larger agencies. What are your views about this? Actually it is not about smaller agencies versus bigger agencies. It has always been about a sound, feasible and appropriate idea or strategy. If a client finds an idea sensible, he will appreciate it in whichever case, whether it comes from a small agency or a bigger one. Q: What is your growth strategy for the coming year? Apart from 360-degree creative services, we are expanding to fulltime production and direction services both for our existing clients as well as for new ones. Expansion with one more branch is also on the cards. hi manoj, how are you doing, pl let me know your email id..